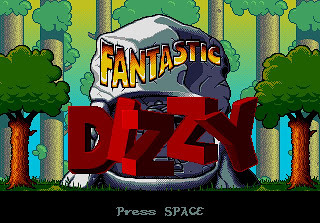 Fantastic Dizzy (a.k.a. 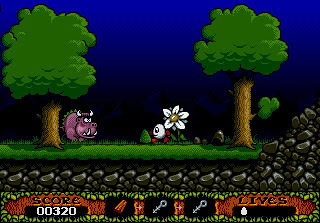 The Fantastic Adventures of Dizzy) is a platform game released by Codemasters in 1991. The game was awarded the 'NES Adventure Game of the Year 1991' by Game Players Magazine and given the coveted 'Parents Choice Award'. The story of Fantastic Dizzy happens when his girlfriend Daisy has been captured by the evil wizard Zaks. Dizzy has to leave his Yolkfolk's treehouse and start his adventure in getting back his girlfriend. 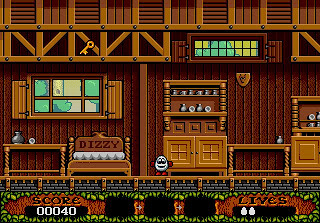 Fantastic Dizzy follows the same pattern of other platform games like Mario Bros and Jazz Rabbit, where we need to go through a few levels, collecting items, avoiding being killed by monsters and reach the next level. 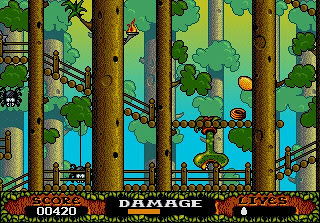 Technically, the graphics and music of Fantastic Dizzy is quite good. The multi-layer backdrop with day and night scene is quite unique too. The sales of 125,000 copies should give us some indication of its reception. You can download Fantastic Dizzy here.